The New York Knicks are in desperate need of what feels like their ninth facial reconstructive surgery since the turn of the century. After firing Derek Fisher back in February, it was naturally assumed that interim head coach Kurt Rambis would eventually be replaced after a long, healthy, productive comb through the best possible candidates this summer. The Knicks are hopeless until they hire someone who, plain as day, knows what he’s doing. The New York Knicks are giving strong consideration to making Kurt Rambis their full-time head coach, according to league sources. Sources told ESPN.com that Rambis, who has served as the Knicks' interim coach since Derek Fisher was fired Feb. 8, is the preferred choice of team president ‎Phil Jackson, who sources say is pushing for a new multiyear deal for Rambis despite New York's 8-16 record since the coaching change…”Kurt and I have a relationship that goes back to 2001,” Jackson said. “He knows the ins and outs, what pleases me and [what] probably I want to have changed. 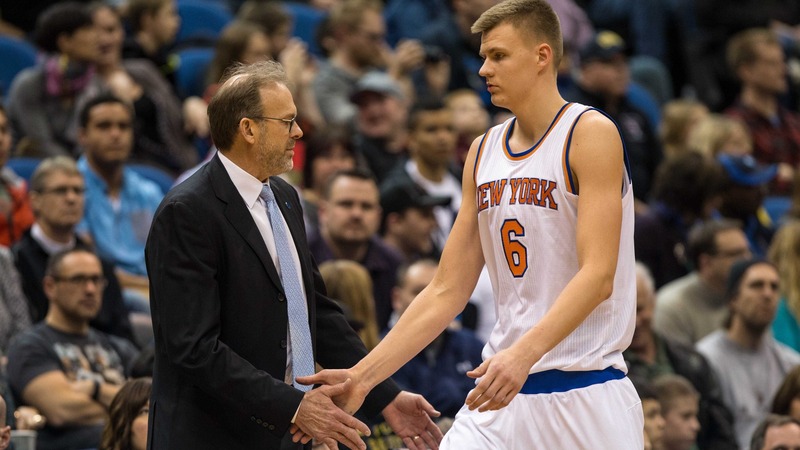 … We have a relationship that's much more tight [than Jackson's relationship with Fisher].” If Rambis lands the permanent job, it would be his second full-time coaching stint in the NBA after a two-season run with the Minnesota Timberwolves in 2009-10 and 2010-11. Rambis posted a 32-132 record in those two seasons with the Wolves following a 24-13 stint as the Lakers' interim coach during the 1998-99 season that was shortened to 50 games because of a lengthy lockout. On paper and in reality, the Knicks are a bad basketball team. Since Rambis took over, only three teams in the entire league have a worse offense. They get a larger percentage of their points from mid-range jump shots than anybody else. They don’t score in the paint or in fast break situations that make life a little bit easier for all involved. Overall, Carmelo Anthony is fine as a first option — but he’s also 31 years old — and Kristaps Porzingis is a prodigious talent whose skill-set is boundless. But other than those two, there isn’t much to write home about. They don’t have a first-round pick in this year’s draft, and their cap space is meaningless during an offseason when well over half the league can spend just as much, if not more, money. Um I didn't beat cancer so that Kurt Rambis could be the Knicks new coach. I'm sick of Phil's choice's. Take Rambis & go. There's an ESPN report says Phil Jackson wants to bring Kurt Rambis back next season, which would be grounds for the Zen Master's dismissal. What they badly need is a competent coach, someone who understands where the league is with a good idea where it’s going. Rambis is not that dude. He spent the past few weeks displaying a clear lack of foresight, combined with a clear lack of understanding that a 7’3" phenom who can shoot threes and protect the rim shouldn’t play small forward. He is a parody of the worst option, which basically means he’s a perfect fit inside Madison Square Garden.